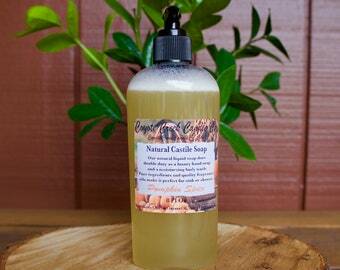 This listing is for (1) 8oz or 4oz Natural Castile Liquid Soap. 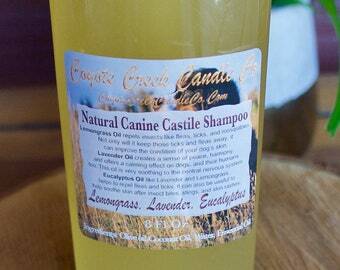 (1) Castile soap is $8 or (3) for $21. If three or more are purchased, I will refund the overage after the order is placed. Our liquid Castile soap is handmade by hot process and contains no sodium lauryl sulfate or other chemical foaming agents. 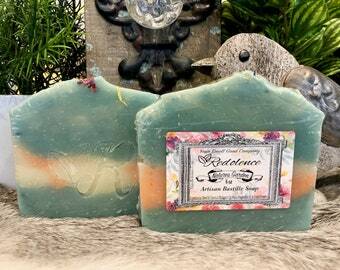 The pH is very close to the skin's own, which is incredibly low for handmade soap. 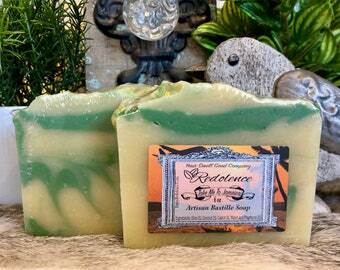 Because our soap contains a high amount of olive oil, it is not as thick as commercial soaps. This does not, however, affect its luxurious lather. 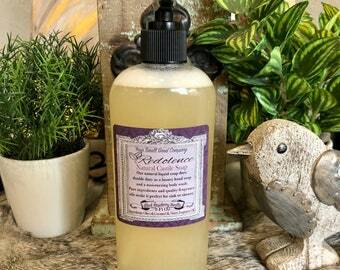 Also, our natural liquid soap does double duty as a luxury hand soap and a moisturzing body wash. 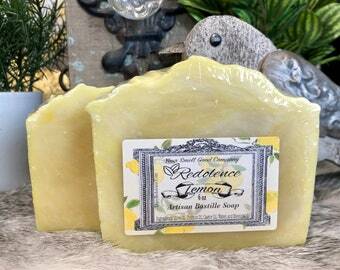 Pure ingredients and quality essential oils make it perfect for sink or shower. Our Castile Recipe is 80% olive oil and 20% coconut oil. It is very moisturizing and cleansing but also has a nice bubbly lather to it. The history of Castile soap is somewhat sketchy, depending on which source you read. However, most sources tend to agree that Castile soap is the name of a soap that originated in the Castile region of Spain. If you go back further in time, you will find that Castile soap has its roots in Aleppo soap. Aleppo soap originates from the region of Syria, from where it made its way to Europe through the Crusades (1095-1291). 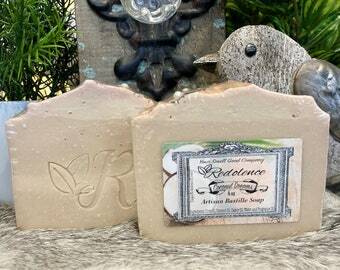 Aleppo soap dates back thousands of years. 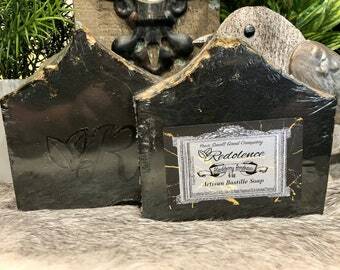 Aleppo soap is a hard soap that is made from olive (Olea europea) oil, laurel bay (Laurus nobilis) oil, sodium hydroxide, and water; you can also add essential oils to it. Olive oil is rich in antiseptic, astringent, and emollient properties. However, the term Castile soap is often used to describe a wide range of vegetable oil based soaps so it is important to check the actual ingredients of Castile soap before buying it. it’s easy to clean with as it doesn’t cause skin irritation like a lot of regular household cleaners. Please note: Just because Potassium Hydroxide (lye) is not listed in the ingredients does not mean it's not used, During the saponification process lye converts the oils to fatty acid salts (hence all of the "potassium **" prefaced oils listed are the final result of the process. No lye remains in the final product, it is all used by the saponification process to convert the oils to soap. Some manufacturers choose to list the ingredients by the final result instead of listing them as the individual raw ingredients that were added at the beginning of the process. With no lye, there is no soap. Smells Oh! So good!! It's like a peppermint with a hint of vanilla. Reminds me of those candy pink/yellow/green mint drops that you see at gift stores. Jillian's friendly customer service and fast shipping was a joy. 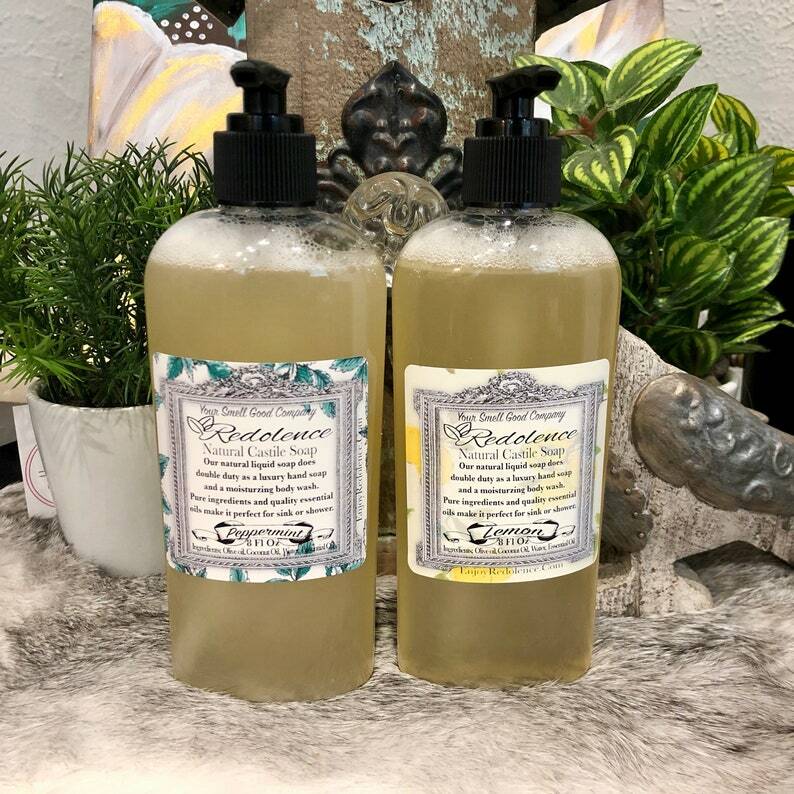 Her handmade unscented version of Castile Liquid Soap is a wonderful option for someone who is dealing with allergies and eczema and needs to avoid certain environmental allergens such as palm oil. I enjoy using the soap for my hand-washing and washing our dishes. The bottles are immediately ready for use or you can transfer them into your own containers. Thank you for your good creations! This seller was phenomenal! My purchase arrived with lightning fast speed even though she was dealing with a fire in her area that temporarily closed the post office.